Applications: Furniture upholstery, Leather, sofa, Car seat, Cushion, Air bag, Container bags, Wide textile lifting slings & cargo lashing strap, Safety belts and Harness, Sails, Tents, Awnings, Canopies, Military Parachutes, Crane slings, Spray hood, Carpets, Luggage, Industrial safety products, Construction Barriers, Field covers, Divider curtains, Protective clothes etc. 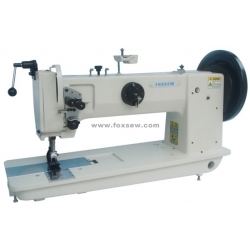 Features: This model is the king size of extra heavy materials compound feed lockstitch sewing machine of FOXSEW brand, it adopts vertical rotating hook, sliding lever thread take-up. We divide it into single-needle and double-needles. It adopts Synchronic feeding of needle bar and feed dog. The comprehensive performance of whole machine is so strong, especially includes these aspects: smooth drive train, low noise, large operation space, we also installed the clutch device to pretend the rotating hook from overloading, insure the safety of products and rotating hook. 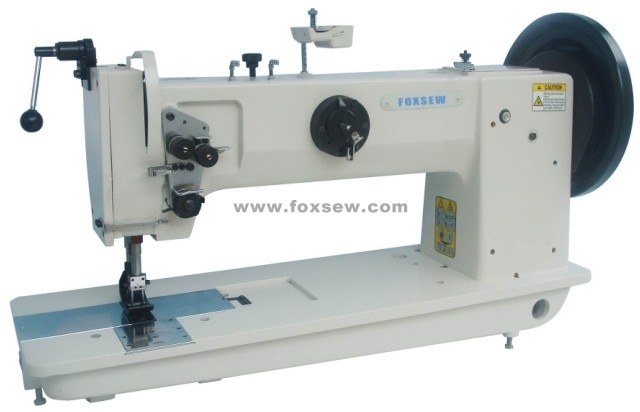 Convenient operation of pedal type reverse-feed, push-button type needling-distance regulating mechanism, adopts concealed bobbin winder, equipped with automatic lubrication rotary horizontal hook, it can reduce the frequency of changing the baseline when sewing thick seaming work piece. It is suitable for leather, artificial leather, Canvas, nylon chemical fibber, synthetic material, rubber and so on which is extra heavy materials, used for sewing sails and tents, cushion, sofa, beach umbrella, truck’s hook etc.